Like thousands of other Star Wars Fans I will be making the trek to Anaheim, California for Star Wars Celebration VII next week and if you are a Star Wars fan like me you probably pride yourself in your knowledge of the characters, locations, and technology from the Star Wars films and TV series. Well, now you can put your knowledge to test and help Uncle Milton create their upcoming Star Wars Science Jedi Holocron. STAR WARS FANS BEING ASKED TO TEST JEDI KNOWLEDGE AGAINST THE FORMIDABLE 20Q ARTIFICIAL INTELLINGENCE! GO TO http://starwars.20q.net/play AND PLAY!!! Six new items feature innovative technologies, real science-based toy experiences, and a whole new way for kids to experience the world of Star Wars! In 2009, Uncle Milton launched a popular line of innovative toys, providing real science learning and a direct connection between the Star Wars universe and our own. Now, with the next generation of Star Wars movies comes the next generation of Star Wars Science toys with six new, innovative items in 2015. Use a Jedi Force Levitator to suspend objects in mid-air, a light blaster to create phosphorescent light-up Star Wars scenes, a Jedi Holocron that can read your mind, and the power of your concentration to move holograms with the amazing new Force Trainer! Featuring innovative technologies and real science-based toy experiences, these new toys will inspire kids through science while providing fans of all ages with fun, new ways to experience the world of Star Wars. The Force Trainer II: Hologram Experience: In 2009, Uncle Milton launched one of the most innovative Star Wars toys of all-time – The Force Trainer. This incredible toy enabled fans of all ages to move and control an object with the power of their mind using real brainwave technology and quickly became a hit with Star Wars fans and the media worldwide. In 2015, Uncle Milton introduces The Force Trainer II: Hologram Experience, where once again you are the Jedi, but this time aspiring Jedi can use their concentration to move holograms! Imagine that you could raise an X-wing Fighter from the Dagobah swamp just like Luke Skywalker, battle Darth Vader, or build your own lightsaber with just the power of your mind! These magical scenes are re-created through hologram images and a wireless headset with real brainwave sensors that read and interpret your levels of concentration. The more you focus, the more successful you are in moving and controlling the hologram image and successfully completing the Jedi challenge. The hologram images and Jedi challenges come through a companion app included with the purchase of the product and powered by the user’s tablet device which projects these holograms into the unique Jedi themed training base. There are 10 different Jedi training levels through which fans can advance from Padawan to Jedi Knight to Jedi Master, with instruction and guidance from Jedi Master Yoda. Additional Jedi challenges will also be available for download on updated versions of the app as new Star Wars movies are released. Ages 8+. SRP $119.99. Available Fall 2015. Jedi Force Levitator: Now Star Wars fans can magically suspend and move objects in mid-air just like a real Jedi, using an invisible electrostatic force! Force Push with the Jedi Training Rod. Then, Force Pull using just your hands! Includes 3 different targets and a Jedi Training Rod with real static electricity generator inside. Ages 6+. SRP: $24.99. Available Fall 2015.
magically disappear! Just release UV light from the blaster to charge and create a glowing scene or drawing. the-dark decals for added fun. Ages 5+. SRP $29.99. Available Fall 2015. 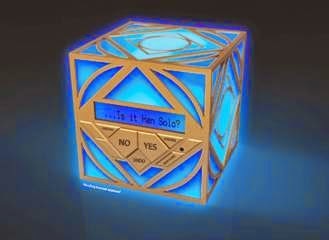 Wars Rebels TV show on Disney XD, the Jedi Holocron provides hours of interactive, thought-provoking fun! Ages 6+. SRP: $24.99. Available Fall 2015.
with both blue Jedi and red Sith light colors to choose from. Ages 6+. SRP: $19.99. Available Fall 2015. Galactic Battle Wonderscape: Create and display glowing, light-up, Star Wars scenes, magically suspended in gel! See chemistry in action as ingredients mix together to form a unique suspension gel. Then, place the different images into your Star Wars scene and display it with the light-up base. The dual mode light base includes ultraviolet light that activates glowing scene components and creates an amazing glow-in-the-dark Star Wars scene for your room! Ages 6+. SRP: $24.99. Available Fall 2015. • Lightsaber Room Lights: Build your own lightsaber just like a Jedi, featuring your favorite StarWars character’s hilt. Then, display it in your room and use the remote control to activate the lightsaber’s awesome light and sound effects at night! • Force Lightning Energy Ball: Harness the power of Force lightning, just like Emperor Palpatine! Touch the energy ball and see pulses of plasma energy stream directly towards you. It’s also great for in-room display. • Death Star Planetarium: Watch the Star Wars galaxy come to life on your ceiling! Use the tabletop Death Star planetarium to display the Star Wars galaxy or view the Earth’s own night sky! • Mini Lightsaber Tech Lab: Discover the science of light and optics as your build your own mini version of Anakin Skywalker’s lightsaber. Includes 4 different colored crystals. • And other fun items like the Mini Lightsaber Dark Side Detector, Boba Fett Launch Lab, Jedi Telescope, Mustafar Volcano Lab, and Star Wars Mini Labs! For more information on Star Wars Science, visit www.unclemilton.com/star_wars_science. Uncle Milton Toys will be at booth #1244 for the Anaheim 2015 Star Wars Celebration. Be sure to check them out!